To diversify oil based economy, Kuwait government is investing from its reserve capital for infrastructure development. As per the National Development Plan implemented in 2010, government has approved over $100 billion for the infrastructure projects in the areas of housing units, hospitals, expansion of airport terminal, rail & metro, commercial buildings and educational institutions, including new city. According to 6Wresearch, Kuwait Air Conditioner Market is projected to grow at a CAGR of 4.17% during 2015-2021. In Kuwait air conditioner market, centralized air conditioner accounts for majority of revenue share in 2014. Centralized air conditioner system is expected to maintain its market dominance through the forecast period. Amongst all regions, Kuwait City has captured major share of the market in the overall region owing to growing construction activities and government investments. Some of the key players in the market includes- Carrier, York, SKM, Trane, Fujitsu General, and Gree. The report thoroughly covers the air conditioners market by AC types, applications and regions. The report provides the unbiased and detailed analysis of the on-going trends, opportunities/high growth areas, market drivers, which would help the stakeholders to decide and align their market strategies according to the current and future market dynamics. •	Historical & Forecast data of GCC Air Conditioner Market for the Period 2010-2021F. •	Historical & Forecast data of Kuwait Air Conditioner Market Revenue for the Period 2010-2021F. •	Historical & Forecast data of Kuwait Window AC Market Revenue & Volume for the Period 2010-2021F. •	Historical & Forecast data of Kuwait Split AC Market Revenue & Volume for the Period 2010-2021F. •	Historical & Forecast data of Kuwait Packaged AC Market Revenue & Volume for the Period 2010-2021F. •	Historical & Forecast data of Kuwait Free Standing AC Market Revenue & Volume for the Period 2010-2021F. •	Historical & Forecast data of Kuwait Cassette AC Market Revenue & Volume for the Period 2010-2021F. •	Historical & Forecast data of Kuwait Centralized AC Market Revenue for the Period 2010-2021F. •	Historical & Forecast data of Kuwait Centralized AC Market Revenue, By Components for the Period 2010-2021F. 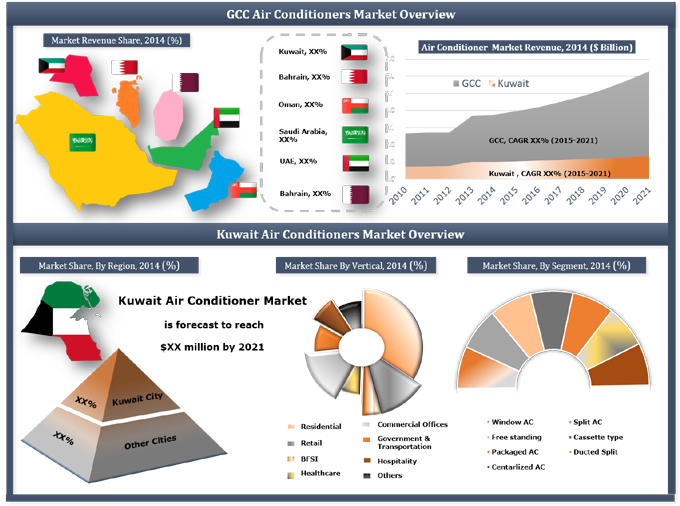 •	Historical & Forecast data of Kuwait Air Conditioner Application Market Revenue for the period 2010-2021F. •	Historical data of Kuwait Air Conditioner Regional Market Revenue for the Period 2010-2014. •	Market Size & Forecast of Kuwait Air Conditioner Regional Market Revenue until 2021F. 19.5	GREE Electric Appliances Inc.
19.8	Samsung Gulf Electronics Co. Ltd.
Kuwait Air Conditioner market is growing slowly as compared to other GCC regions. As Kuwait's vision to become commercial and financial hub of Middle East region by 2035.This plan envisages intensify growth in Kuwait air conditioner market as government is investing huge capital in construction industry in order to execute 2035 plan. Mega projects are in pipeline includes Shadadiyah University Campus,Silk City, various housing projects, Kuwait Metro and many more which would spur the air conditioner market in the country. Kuwait air conditioner market report has been segmented into AC types, end user applications and regions. The major companies in Kuwait's air conditioner market include- Carrier, York, SKM, and Trane.